Rural Fencing Supplies now have bird netting available for the protection of fruit trees. 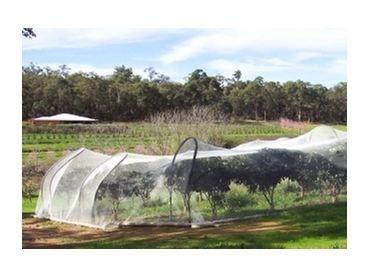 This bird netting is supported over rows of fruit trees thanks to independent smooth arches of 50mm black PVC irrigation pipe at each end of a row of trees. Each row of trees also has arches at 6m to 8m intervals, which are a sufficient height to allow for the trees to grow. The bird netting is stretched over these arches and it's perimeter is wrapped around pine logs. If the bird netting's width or length is not sufficient it can be stitched or laced together to achieve the appropriate size. For single trees these posts can be planted in a square and the arches crossed over each other at the top where they may be tied or bolted together.